Should You Structure the Sale of Your Business as an Asset Sale or an Equity Sale? Although deal lawyers generally describe their practice as involving “mergers and acquisitions,” the sale of a small or medium-sized business is usually structured as either an equity sale or an asset sale. In an equity sale, the purchaser buys the equity from the owner(s) of the target company — stock in the case of a corporation and membership interests in the case of a limited liability company. The business is transferred to the new owners, corporate or limited liability company entity and all, and the target becomes a wholly-owned subsidiary of the purchaser. There is no change in the status of the target entity itself, and its contracts, assets, and liabilities remain with the entity. 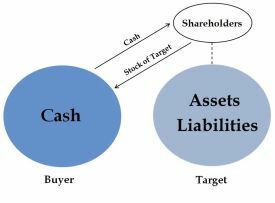 In an asset sale, specified assets are transferred from the target company to the purchaser, while the corporate or limited liability company entity remains in place and continues to be owned by its equity holders. The assets transferred might be all or substantially all of the target’s assets, or they might be more limited in scope. 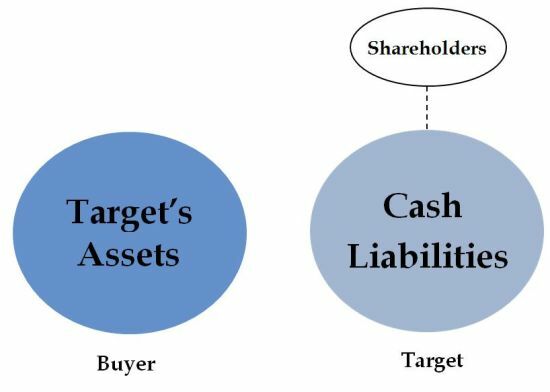 Similarly, some or all of the target’s liabilities might be transferred to the purchaser or retained by the target company, although most of the liabilities often stay with the target. As illustrated below, in the equity sale, the target’s equity holders sell their equity directly to the purchaser in exchange for the purchaser’s consideration, which in the illustrations below is cash. The result is that the entire target company, including its assets and liabilities, is now held by the purchaser, with the target company remaining intact. The selling equity holders are left holding the cash. 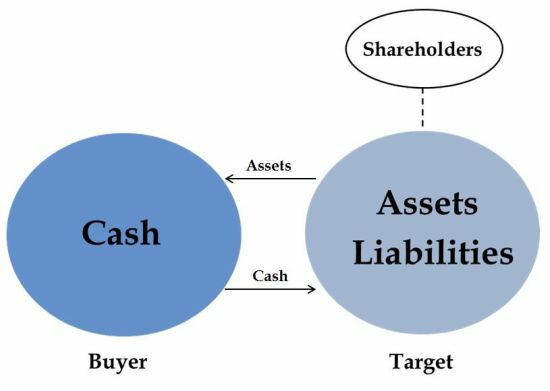 In an asset sale the target company’s assets, and sometimes its liabilities, are transferred to the purchaser. The ownership of the target’s corporate or limited liability company shell does not change hands. Note that, while the purchaser’s legal transaction is with the target’s equity holders in an equity sale, the transaction is with the target itself in an asset sale. Now let’s take a look at some issues that purchasers and sellers need to consider to determine whether to structure a deal as an equity sale or an asset sale. In general, purchasers prefer asset sales and sellers prefer equity sales. Do the parties wish for all of the target’s assets and liabilities to be transferred to the purchaser? In an equity sale all of the assets and liabilities remain with the target company. If the parties wish that only some of the target’s assets be transferred to the purchaser, then an asset sale will be preferable. 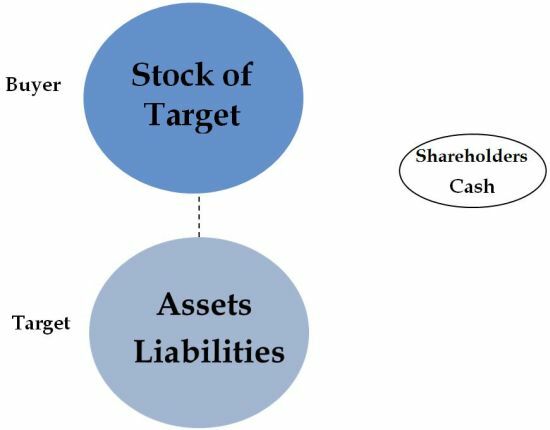 In addition, if the purchaser wants to leave some or all of the target’s liabilities with the seller, then an asset sale will be preferable to an equity sale, because the purchaser indirectly assumes responsibility for all of the known and unknown liabilities of the target when a transaction is structured as an equity sale. An advantage to the purchaser of an asset sale is that the purchaser can allocate the purchase price for tax purposes among the various purchased assets to reflect their fair market value. In addition, the purchaser’s tax basis in the assets is equal to the purchase price of the assets. In the case of assets that have been depreciated by the target company, the purchaser’s basis in the assets is higher than it would be on the books of the target company. This advantage is off-set to some extent, however, in states like New York that do not have a “casual and isolated sales” exception and thus impose sales taxes on certain types of assets in the acquisition context. In addition, some states impose taxes on transfers of real property, which can often be avoided if a transaction is structured as an equity sale. A disadvantage to the seller of an asset sale is the double taxation that can result if the target is a C corporation. The sale of assets is generally a taxable event that results in the imposition of tax at the corporation level. The sale proceeds are taxed again when they are distributed to the shareholders in the form of a dividend or a return of capital. In contrast, in an equity sale, the seller generally pays the applicable short-term or long-term capital gains rate on the sale of his or her stock, and there is only one level of taxation. Some governmental authorizations, permits, and licenses are not transferable. If the target company holds such permits and licenses, an equity sale might be preferable to avoid the necessity of transferring them to the purchasing company. Structuring a transaction as an equity sale won’t solve the problem in all cases, but it often does. If the target company has material contracts that aren’t assignable without the consent of the target’s counter-party due to anti-assignment clauses contained in the contracts, an equity sale might be preferable. Because the target’s contracts remain intact in an equity sale, they generally are not assigned and thus consent isn’t required. The parties should use caution, however, because some contracts define “assignment” to include a change of control, which would be triggered in the event of an equity sale. State corporation laws need to be considered when a business is sold via an asset sale. The sale of all or substantially all of a corporation’s assets generally requires the approval of the corporation’s board of directors and shareholders. In contrast, a stock sale does not require the approval of the target company’s board of directors, although in most cases it requires the consent of all the shareholders. If the target company is financially distressed, transfers for less than reasonably equivalent value might pose issues under the federal bankruptcy statute or state fraudulent conveyance laws. So which structure is best for you? It all depends on your circumstances, but there’s certainly a lot to think about. Buying or selling a business is a complex transaction that requires an effective negotiating platform to ensure professionalism, and complete the transaction quickly and efficiently. Buying a store, especially in the retail sector, involves multiple factors that you don’t find in other sectors. And this blog really shared a valuable information about all these.